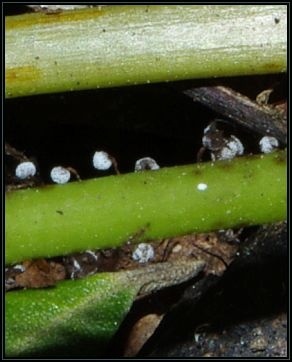 Description: Minute fruiting bodies with a long stalk and globose sporangia growing abundantly on Oxalis stem and leaf litter. 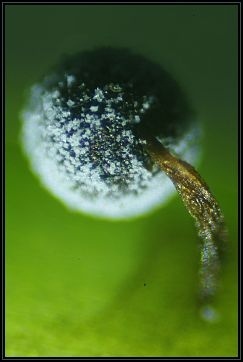 Sporangia are coloured a dark bluish-black with an outer cover of white flocculose crystals. Stalk is brownish to dark yellowish brown, furrowed, thin but widens towards the base forming a circle. 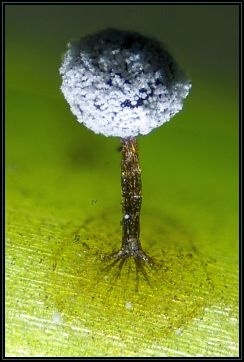 Size of individual fruiting body is <1mm diameter and about 1mm in height. 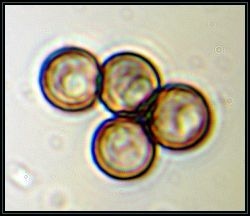 Spores are rounded, hyaline, smooth and around 10µm in diameter (4 spores). Sporangium - composed of 20 photos stacked using Combine ZM free software. 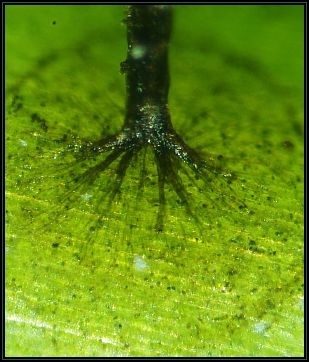 This taxon was identified by Mr. Michael Briffa.